The way that Literacy Care delivers intervention is unique. In the vast majority of consultation type businesses and in other places where educational services or products are delivered there is a pay as you go or fee for consultation model. In other words parents pay the practitioner at each visit for the time spent with the child. Naturally there is an understanding that the practitioner has provided quality services. However in many cases there are questions about how long the child will have to attend sessions and what are the goals to be achieved each session or even what the overall goal is within a timeframe. Literacy Care provides services according to an outcomes model rather than an activities based model. 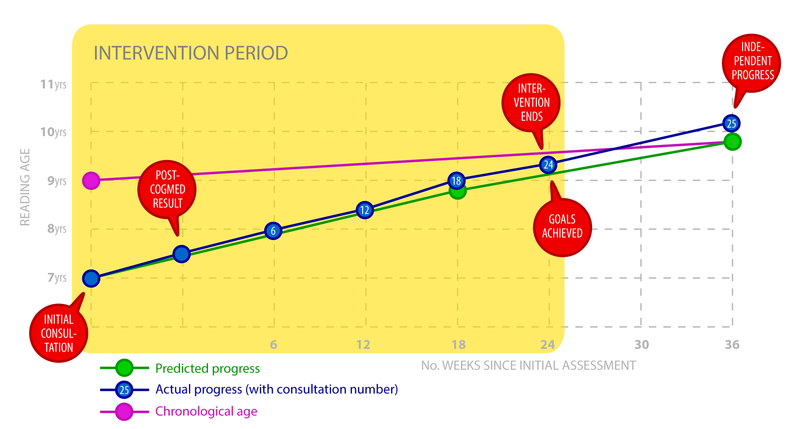 This means that following the assessment process (and this is why it is comprehensive) it is possible to predict, with a reasonable amount of certainty, what measurable outcome can be achieved in a given time period. What will be the duration of the whole intervention? How frequently will the child have to attend consultations? How intense will the child have to work during the intervention? Where can we expect the child to be in 3 months, 6 months or even 12 months following intervention? Will a second bout of intervention be needed after the first bout has concluded? What will the child do in periods of recess to ensure that they ‘stay on track’ to achieve the goal? What will the new trajectory of learning look like? What will be the financial commitment for the intervention? These are important questions for all parties concerned. Goal setting is one of the critical factors necessary to answer such questions. The graph below shows the expected trajectory (green line) and the expected goal of a child who is 2 years behind in their reading over a period of 10 months. The blue line shows the child’s test results every 6 weeks. Note the blue line remains either consistent with or above the green trajectory line. The student gains 36 months in reading ability in 10 months.